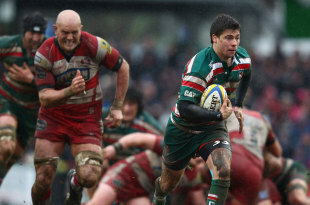 Leicester Tigers coach Matt O'Connor has lashed out at the England camp over their treatment of Ben Youngs and Toby Flood. The Australian believes that the halfbacks have been mistreated by England's interim coach Stuart Lancaster and also that the national side are not interested in creative players, just in "trying not to lose". Flood has been released to play for Leicester this weekend after dropping behind Owen Farrell and Charlie Hodgson in England's fly-half pecking order, while Youngs mans the bench for their trip to face France after losing his spot to Lee Dickson, the Northampton scrum-half. "We consistently score the most tries in the Premiership because of those two blokes," O'Connor told the Leicester Mercury. "They just provide the rest of the team with so many opportunities, but the powers-that-be at England have not fully appreciated what they can offer a team. England don't want creative players, they are just trying not to lose. "If that is what they are trying to achieve, you can understand why Flood and Youngs are not the best blokes for the job, but if you are going out there to win a game, it has got to be Flood and Youngs at nine and 10. "There is nothing I have seen so far (in the Six Nations) that indicates England want to go out and beat teams. Under the current structure, I cannot see that changing." O'Connor's criticism of England's attacking game stretches beyond their treatment of Flood and Young, with the Australian claiming Lancaster and assistant coach Andy Farrell are wasting their best attacking threats. "Chris Ashton, Ben Foden, Toby Flood and Ben Youngs have won England every big game they have won in the last 18 months against the good sides," O'Connor said. "At the moment, you wouldn't know that Ashton and Foden are on the field. "Those guys, along with Manu Tuilagi are as good a back line as there is anywhere in the world but they never see the ball. That is an issue for the RFU to address. If you are talking about building a side for the World Cup in 2015, you have to go out and play."